There will be a protest rally in Upton-on-Severn's Lower High Street on Saturday, 2nd September 2006 at 3pm, starting from the King's Head Yard. Everyone is welcome. Residents and businesses in Upton-on-Severn are angry about the closure of the public conveniences in Lower High Street. "We get a lot of tourists visiting the Town and they need facilities. Some coach drivers have stopped coming here because there are no conveniences in the centre of town. 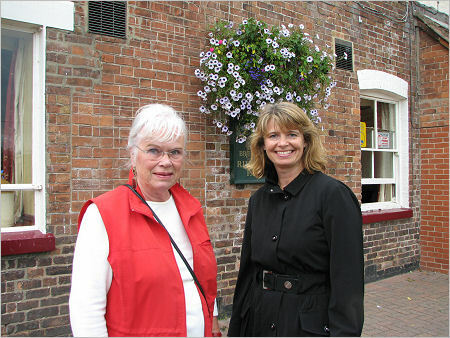 It's a real burden for local pub landlords", said Councillor Mary Wilkinson of Upton Gardens. Local Conservatives have been active in putting pressure on Malvern Hills District Council to reopen public toilets in Upton, Tenbury Wells and Malvern. "We presented a petition of almost 700 signatures to Lib Dem leader Di Rayner at a Special Council Meeting in April and it was ignored," says Phil Grove, Mayor of Tenbury Wells. Harriett Baldwin, prospective Conservative candidate for West Worcestershire explained, "Since I was selected last month, I have been made aware of this issue by so many residents and businesses. I've written to Di Rayner, the Lib Dem leader, and have organised the upcoming march to raise the issue. It seems to me that this is an essential public service and I will do everything I can to try to persuade the council to put the same emphasis on this issue as Wychavon District Council which has award-winning public loos".